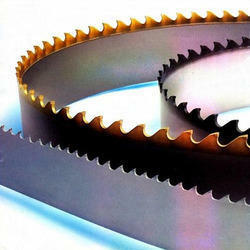 Prominent & Leading Exporter from Kolkata, we offer bimetal bandsaw blades. Our clients can avail a wide assortment of Band Saw Blades from us in varied specifications as per their needs. This blade is precision engineered at our vendors' well-developed production unit using premium quality raw material. The offered blade can availed in various sizes and dimensions widely demanded among our valuable clients. Our vendors’ quality experts check entire range of saw blade on well-defined parameters in order to deliver flawless range at clients’ end. Looking for Band Saw Blades ?